So basically all we’ve done this Fall is make casseroles, soups and sheet pan meals. And when I say it out loud (or write it I guess), it actually sounds like we are doing it exactly as you should when the weather gets chilly. 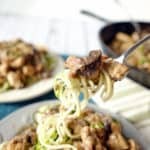 This sheet pan crispy vegetable noodles and pork recipe makes for a super flavorful dish and delicious leftovers you will look forward to. 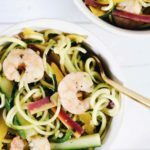 I’m just going to get this out of the way…if you don’t own a spiralizer yet, you should definitely consider investing in one! They aren’t too expensive and don’t take up much space either. It’s a different way to enjoy veggies. 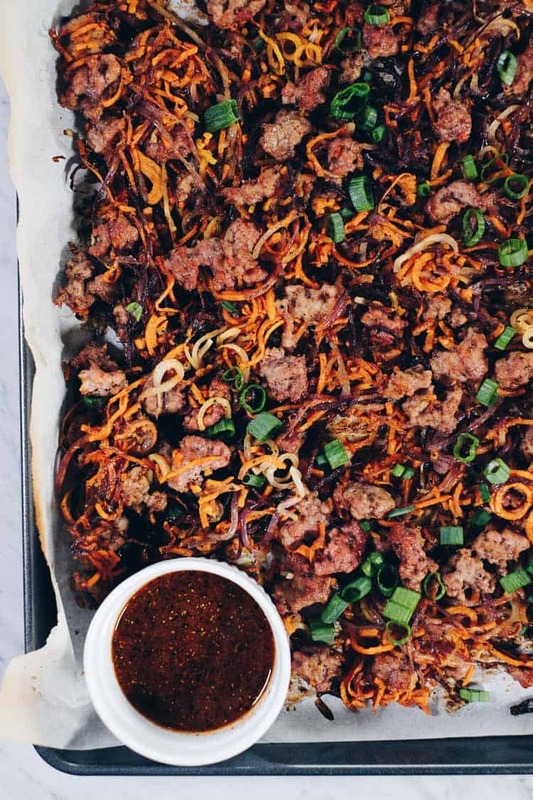 In this sheet pan crispy vegetables and pork recipe, the veggies get spiralized to turn them into “noodles”. Spiralizing is quite easy really, but some veggies are easier than others. We find that carrots are a little trickier, so try to use the biggest ones you can find for this recipe. The greater the square footage of the veggie makes it easier to turn them into noodles. 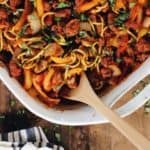 You will be so glad you invested in a spiralizer when you enjoy this sheet pan crispy vegetable noodles and pork recipe! 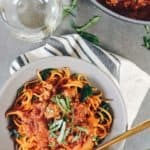 It’s so nice to have a new way to enjoy vegetables, and turning them into noodles makes it easy to get them crispy, which you can’t really accomplish with regular roasted veggies. Once the veggies are spiralized, it is seriously a breeze to throw the rest of this meal together. All the veggies get put on a big sheet pan and tossed in avocado oil and sea salt. Then, you just break up the ground pork with your hands and sprinkle it all over the veggies. And, in the oven everything goes! Once the spiralizing is finished you will feel like a champ and the rest of the preparation is a breeze. While your vegetable noodles and pork are cooking, make a quick sauce. You just whisk everything together in a small bowl or jar and then set it aside while the sheet pan finishes cooking. Go put your feet up and relax while you wait for dinner to finish cooking. 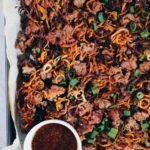 Get ready for the delicious flavors and textures of this sheet pan crispy vegetable noodles and pork recipe! You will crave the leftovers and enjoy a fresh way to eat your veggies. Let us know how it goes by leaving a comment below. Also, take a photo and tag us on Instagram @realsimplegood, so we can check it out! 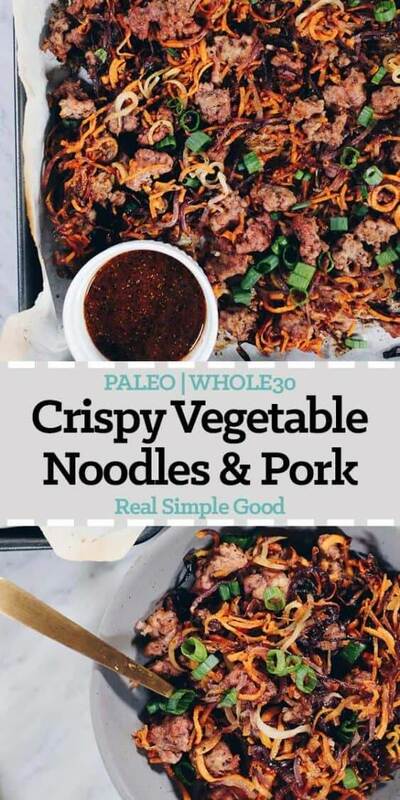 Enjoy the delicious flavors and textures of this Paleo and Whole30 Sheet Pan Crispy Vegetable Noodles and Pork recipe! You will crave the leftovers! Preheat oven to 400° Fahrenheit and line 1 large or 2 medium sheet pans with parchment paper. 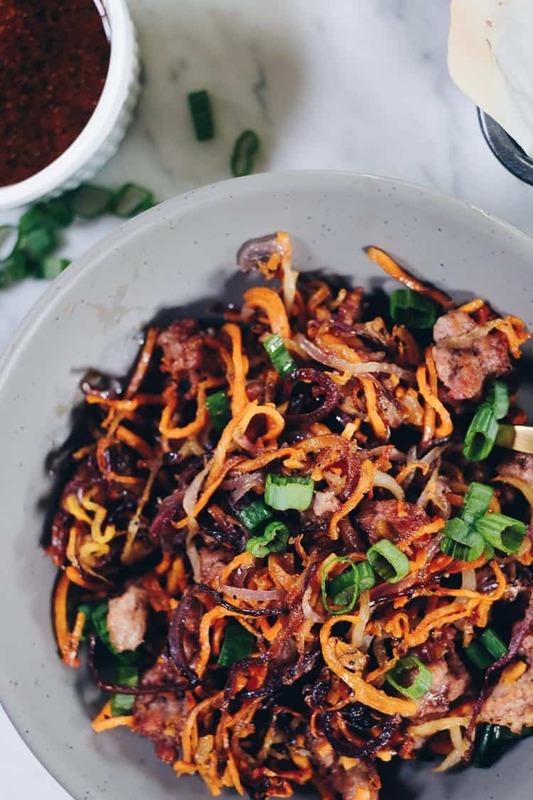 Spiralize the sweet potatoes, carrots and onion. Place them on the sheet pan. Mix them up and spread them out. If the strands are too long, cut them with scissors. Toss the vegetable noodles with avocado oil and salt and pepper (about 1 tsp each). Next, break the ground pork into small pieces with your hands and nestle the pieces of pork evenly among the noodles. Place the sheet pan into the oven and roast for a total of 35 to 45 minutes, stirring every 10-15 minutes to make sure the veggies cook evenly. The veggie noodles are done when they are tender and have crispy bits all over. Watch them closely in the last 10 minutes to ensure that they don’t burn. 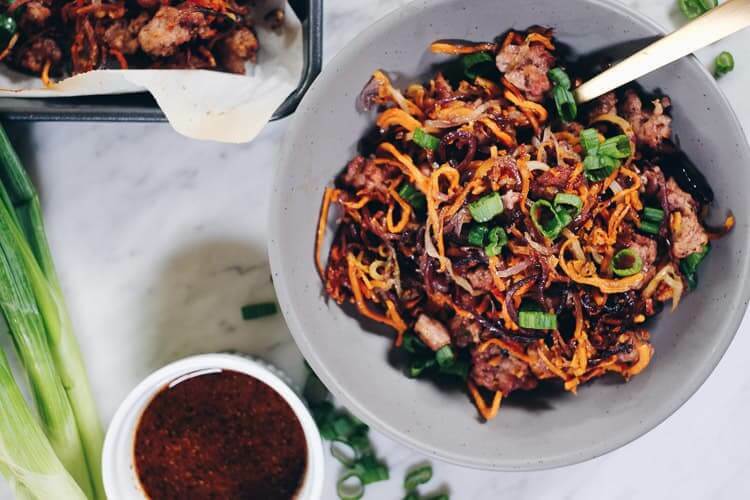 While the noodles and pork are cooking, prepare the sauce by placing all of the sauce ingredients into a bowl or jar and whisking well. Chop green onions as noted. Once the noodles and pork are done, remove from the oven. Sprinkle the green onion over everything and toss to mix. 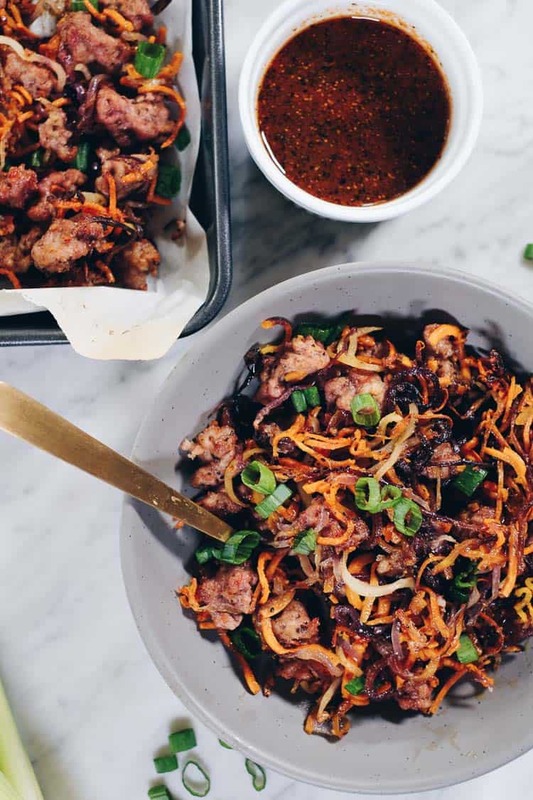 Spoon some sauce onto each serving of the crispy noodles and pork and mix to coat. Enjoy. While mine didn’t look nearly as pretty as yours, it was fabulous! there was nothing left to photograph. I had to cook it for just over 45 minutes, the veggies didn’t want to crisp up. Next time I make this I’ll make sure to use FAT/large carrots and sweet potatoes. Thanks for adding a delish new meal to our rotation!! Oh my gosh, that was so freaking good! I ate 1/2 the pan myself. I don’t own a spiralizer, so I went with what New Seasons spiralizes…they had sweet potatoes, zucchini, and (shredded) carrots. The carrots were a little mushy, but the flavors were SO good. This is a keeper! I hope this is not a horribly silly question… do you brown the ground pork before? No, you don’t need to brown the pork. Just crumble it and put it over the veggies and it will cook in the oven. Absolutely delicious!! Will definitely include in our meal rotation. Spiralized, oven roasted veggies are the best! 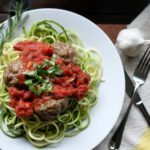 We haven’t tried it with zucchini noodles. If you use them, you’ll have to reduce the cooking time as they will cook quicker than sweet potato noodles. Just check them often and stir to prevent burning, removing when the noodles are cooked. Please come back and let us know how it goes! Now I know why your website is named Real Simple Good, because that’s exactly what this recipe is! Everyone loved it and it will be on repeat, that’s for sure. Simple, easy, and surprisingly flavourful! It has been added to our regular meal rotation. Only thing is I can never get the veggies to crisp up. They taste fine but always a bit soggy. Tried 1 hour at 400 and 40 minutes at 425 but same results. Next time I might try two pans, but then we get into more dishes. I find only one sweet potato makes plenty for four meals so I’m actually using less veggies than called for. So glad you like the recipe and flavor! For the veggies, I suspect that you need to get them spread out more so everything is in a single layer. 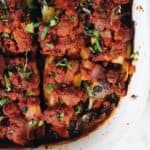 We have a HUGE sheet pan that we use for this recipe. Also, stir the veggies occasionally to even out the cooking. Lastly, you could try broiling for a few minutes at the end to get things to crisp up, just be careful to watch it closely and remove before burning. I just made this for the first time and I am literally standing here eating it directly from the pan, it is so good. It’s satisfying, which is hard to pull off with a Whole30 recipe! Trader Joe’s makes this recipe SO easy. they have spiralized sweet potatoes and carrots in the produce section. I used their pre-diced onions instead of spiralizing it and it turned out fine. Thank you thank you thank you!